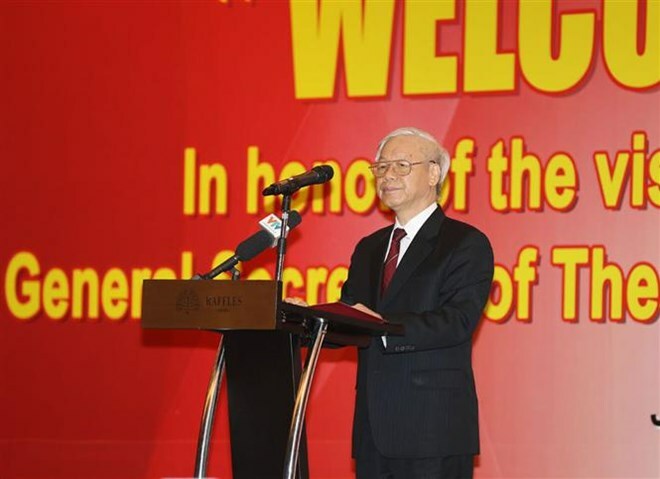 Hanoi (VNA) – Party General Secretary Nguyen Phu Trong on August 23 attended a banquet hosted by the Indonesian Chamber of Commerce and Industry (ICCI), during which he called on Indonesian enterprises to invest more to Vietnam. He said that after over 30 years of doi moi (renewal), Vietnam has become a developing country with middle income, good economic growth, stable socio-political stability and strengthened defence and security as well as enhanced position in the world arena. Highlighting abundant business opportunities in Vietnam, the Party chief said that Vietnam has significantly improved its business and investment environment and become attractive to investors. Vietnam is striving for average economic growth of 6.5-6.7 percent each year in the next five years, and per capita GDP of 3,200-3,500 USD by 2020. He clarified that Indonesia is now the fourth largest partner of and the fifth biggest investors of Vietnam in ASEAN, stressing that Vietnam highly values efforts of Indonesian firms and believes in the prospects of bilateral investment ties. Vietnam always welcomes Indonesian investors and businesses, he underlined. He also hailed the fruitful outcomes of the seventh meeting of the Vietnam-Indonesia Committee for Economic, Scientific and technological cooperation, expressing his belief that the meeting helps boost friendship and affiliation between the two countries. At the event, Indonesian Minister of Villages, Underdeveloped Regions and Transmigration Marwan Jafar said that Indonesia and Vietnam are strong in some agricultural products and processing such as rubber planting and production, stressing that cooperation will help both sides further develop.